I knew going in the previews had shown nothing past the first third of the film, which is quite unusual in film marketing. I had read up on some of the technical things Cuarón had done to create a sort of zero-gravity look. I’d heard the comparisons to 2001: A Space Odyssey. I understand why the comparisons; one starts with the primordial and shows humans progressing into space, the other starts with humans at the apex of modern invention. but it’s not there. 2001 is abstract, about humans at large learning to embrace the vast limitless future. Gravity is personal, about us individually coming to grips with our own humanity, literally and metaphorically letting go of what holds us down while – as the poster says – holding on for dear life. And the stand-in for ‘what holds us down’ is pretty basic; no subtle storytelling or complex arcs, just nuanced acting and phenomenal set pieces and the sound mixing to bring both powerfully across. You should see it. It’s brilliant, lovely, transcendent, important, progressive, and it’s going to get quite a few academy award nominations, not the least for sound design. But the nature of it means if the promos haven’t sold you, I won’t. And I can’t talk about how I really feel without delving into how I thought it was going to end. So from here on out: spoilers, spoilers, spoilers. When Matt came back to Ryan, opening the hatch to talk to her in what turned out to be a vision/hallucination, I was sure this was the beginning of “An Occurrence at Owl Creek Bridge.” Ryan would get to earth, as she did, crawl up on the shore, and the camera would pan to news reports or possibly another ship launching in the distance, which through another perfect camera slow zoom would take us back up into space where we’d see Ryan’s rigid body still strapped into her seat, a quasi-serene look on her face. Of course Kowalski’s reappearance was the beginning of her death hallucinations. Of course her thinking she lived through the hatch being opened would be the final absurd nail in the coffin. Of course the following eight obstacles up to and including almost drowning were too much to be accepted even with a healthy suspension of disbelief. Everything going wrong was an excuse for the visuals. And that’s 100% justified, because jawdropping doesn’t come close to describing it. But at some point the constant close calls change a modern space drama into a different sort of film, in the same way one jumpy moment with a dead crew member works, but a constant barrage of them would turn it into a horror film in space. At the point where Ryan turned down the ship’s systems and resigned herself to inevitable death, death *was* inevitable. Ryan had accomplished her personal journey. She had conquered her personal fears, she had accomplished metaphorical and literal rebirth, she had let go of the things holding her back. She’s passed the point of improbable survival into impossible. It was a given she was dead. Except then the film never confirmed this. 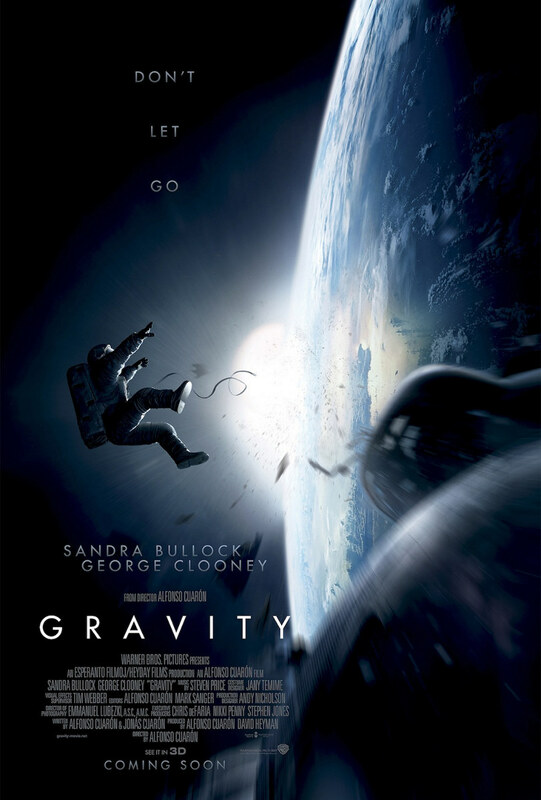 I can’t believe it’s lack of imagination: not after seeing the rest of Gravity; not from the wily promoter who presented Clooney as almost equally billed with Bullock, thus allowing us to accept when Kowalski came back through the hatch, maybe this would be an extended sequence instead of a cameo; not from the guy who abruptly killed off Julianne Moore after only a few minutes of screen time. Is it a sign of pervasive optimism like that shown at the end of Children of Men? That seems the most likely response, though it could also be a sign of Cuarón knowing his audience, assuming once the hatch opened we’d think her dead, then subverting our expectations. If it were only to drive people like myself crazy, it’s working. The whole Really Dead bit is not too often employed in film [moreso in TV], and is a chance to make the same splendidly fantastic film, only without having to ‘excuse’ the absurd leaps taken to get us from visual to visual. It not only takes a more realistic look at life – in a movie which took so many years to make so it could capture the realism of movement in space – but it’s a twist which doesn’t cheat and which has literary precedence. And so, I can’t fully understand why he didn’t take this avenue. This thought and the breathless feeling of especially the first 15 minutes are what stick with me, and will probably remain for quite some time.